It was one of the most anticipated finales in the history of television and it did not disappoint! The last episode of AMC’s “Mad Men,” Sunday’s “Person to Person,” was a non-stop barrage of highs and lows as each character had their curtain call. Where did everyone end up at the show’s end? After McCann’s harsh treatment of Joan (Christina Hendricks), the secretary-turned-partner had a comeback before the series end. She was first tempted by permanent retirement following a cocaine-fueled fantasy session with Richard (Bruce Greenwood). However, Joan later decided that she could not stay out of the game forever, instead opting to start a production company and put her own name on the door of a firm. The other working girl of “Mad Men” had a triumphant finale as well. Peggy (Elizabeth Moss) was offered a partnership in Joan’s new venture, but decided to forego the proposition in order to continue doing what she loved – copywriting – at McCann. She all had another reason to stay – Stan (Jay R. Ferguson). The pair admitted to being in love with each other, a confession that on Peggy’s side seemed like more of a revelation. It seems she finally learned that there was more to life than work. Meanwhile, Roger (John Slattery) appeared to be happy in his volatile relationship with Marie (Julia Ormond), Sally (Kiernan Shipka) was growing up fast back at home with a her dying mother (January Jones), and Pete made good on his promise to move his family to Kansas. However, the big question on every viewer’s mind was what would happen to Don (Jon Hamm)? Well, the retired ad man did not come home for the show’s last hour. Instead, he returned to California where he rendezvoused with Anna Draper’s niece Stephanie (Caity Lotz). The two ended up at a new age rehab retreat where Don tried his hand at yoga and group therapy. After being abandoned by Stephanie, Don breaks down while listening to another man in therapy confess to feeling inconsequential in his life. In the last scene, Don meditates with his therapy group, humming along with everyone looking totally at peace. Then, the show cut to Coke’s “I Want to Buy the World a Coke” ad from 1971, as if suggesting that Don, with his newfound harmony, wrote the iconic campaign. And that was it for seven seasons of the acclaimed AMC series. Life will go on for Don Draper, but that was the last fans will see of it. Check back in Monday for a full review of the episode. 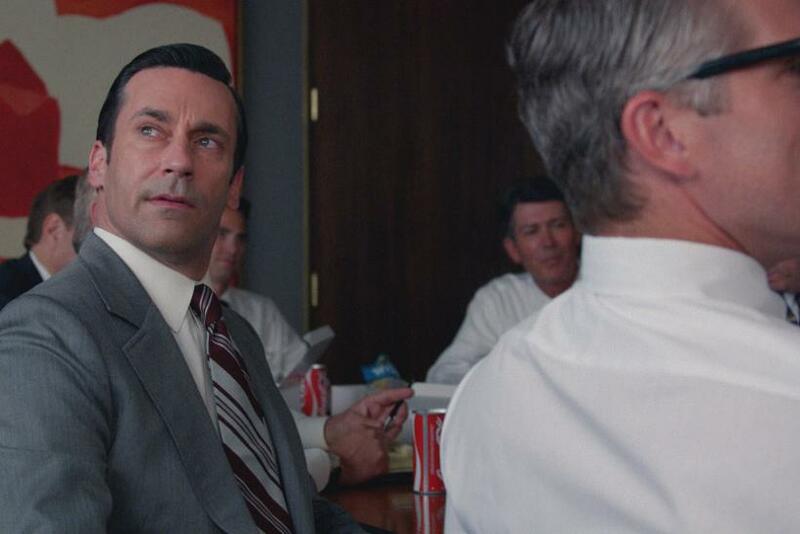 What did you think of the “Mad Men” finale? Tweet your thoughts to @Ja9GarofaloTV. How Will 'Mad Men' End?